We strive to ship our custom orders within 1-2 business days, usually the next day, by Canada Post. We ship from Calgary, Alberta, Canada. Once you have added an item to the cart your shipping options and cost will be displayed and you will be able to see your shipping options and costs before completing the checkout process. 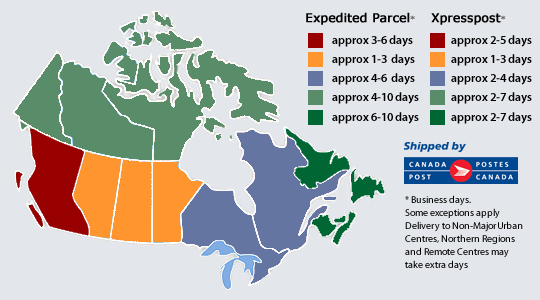 We ship all orders to the US by Canada Post/USPS – your rates will vary depending on speed of shipping option chosen. Most orders are processed and ready for shipping or pickup within 24 hours of your order placement. Orders can often be manufactured and ready for pickup or shipping the same day. Contact us with your requirements. In the event of holidays and summer closures, deliveries may be delayed. Located in the Calgary and surrounding area? We offer in-store pickup for your order. Simply place your order online and choose the pick-up option at checkout and your order will be available at our location in Northeast Calgary, easy access off Deerfoot and 32nd Avenue. To avoid that you attempt to pick up your order before it is ready, please wait for our email that your order is complete. Due to very high overseas shipping costs and shipping times, we currently only ship to Canadian and continental US destinations.